on a deeper level, we should embrace each day for the gift it is. 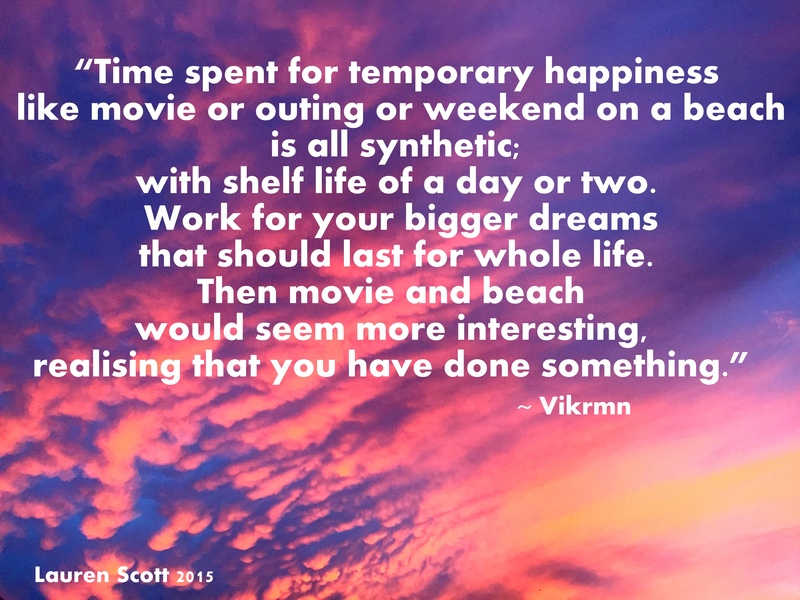 This quote by Vikrmn conveys several points, not all agreed upon, but the larger meaning for me is to focus more on concrete happiness and to allow oneself to dream big – the photo was another gorgeous sunset from last week. Sometimes an ordinary event is most meaningful. The photo below was taken when I visited my daughter at her work. We’re grateful she is now employed full time after graduation and she’s enjoying it. This was a simple day surrounded by beauty. ← You are Worthy and Worth It! Lauren, what a beautiful photo. Whilst I understand what Vikrim is getting at I must say I can’t agree with this quote. After a wonderful day in the Autumn sun spent with my family on the beach I know it will live with me for months ahead and much longer with the peace and joy resting quietly in my soul. Of course every day work etc is important but those weekends I would say are not synthetic. Just my opinion but following a magical day by the shimmering sea just wanted to comment. Thanks, Annika. I have many of those same days and weekends that I don’t consider synthetic, either. I was just looking at the bigger picture in the quote, which I liked. I do appreciate your feedback and wish you another magical day. Many thanks and I know what you mean, wishing you a lovely rest of Sunday and good next week. Warm wishes. Beautiful photo. I don’t totally agree with Vikrim. Life is made up of moments, and we need to enjoy each moment we can. We never know what will come next. Whether a weekend, or a lifetime, every moment counts. Hugs my friend. His examples of temporary happiness aren’t the best, nor the strongest, so I agree with you, Michelle; every moment counts! I edited my text because there are parts of the quote that popped out and resonated with me, mainly the argument of fake happiness vs. true happiness, and of course, following our dreams is paramount. Clearly, though, I should’ve continued quote shopping, but thanks so much for tweeting! 😀 Hugs back to you! Lauren, I don’t know what to think about the quote but wanted to say how thrilled I am to hear that your lovely daughter has found employment that she enjoys. She truly deserves it and so do you! Good counsel there. That bridge scene is very familiar. 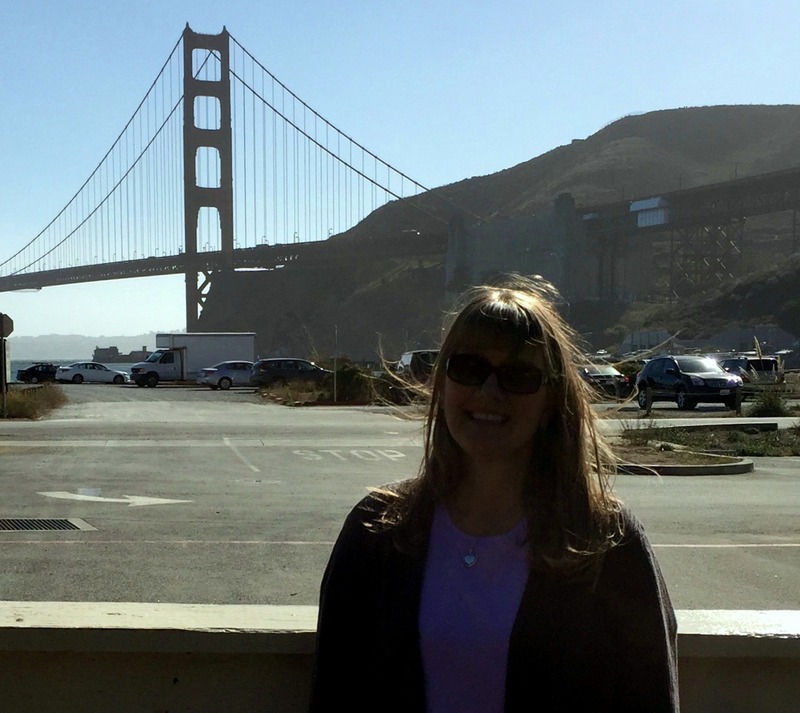 I’ve passed over that many times along with the Bay Bridge. A lot of people do seem to invest everything in short term pleasures which in the long run don’t have a lot of long-lasting value. You touched on one of the points I’m trying to make, Binky, so thank you! Sending well wishes to you and ur family. Congrats on ur daughters job..blessings to u and urs and THIS is what its all about…. I am so thrilled for your daughter, Lauren! I hope she is loving every second of it and learning lots! That is also a very interesting quote, I think both are important in life. Short term happiness and long term happiness, you just need to decide when to do what. Dear Lauren. Hi. First of all thank you for giving an amazing image to my quote (from Novel: “Guru with Guitar”). This Image infused life into this quote, though this quote is not widely accepted 🙂 I would like to thank every one for their views because I believe, “Every vision has its own Rainbow.” There are other 111 life changing quotes in this novel e.g. >> Own your Way, Your own way. >> You are born the day you find yourself. >> Be the master of your dreams, not a slave of your sorrows. >> Dreams you sow, Happiness shall you reap. >> Facing problems? Good. That’s cocoon stage. It makes the wings stronger you know. >> and more. My heartiest congratulations to you and your daughter for she got the job to fulfill her dreams. May you and your family be blessed with more you deserve and desire. Cheers. Vikrmn: (CA Vikram Verma) Author “10 Alone”.